Mr. Cruz, a lawyer, smokes three packs of cigarette every day for the past 20 years. Now on his late fifties, he started to notice that his cough has been going on for more than three months. This has also occurred last year wherein his cough lasted for almost three months. There is sputum production and he experiences difficulty of breathing whenever he performs his daily activities. 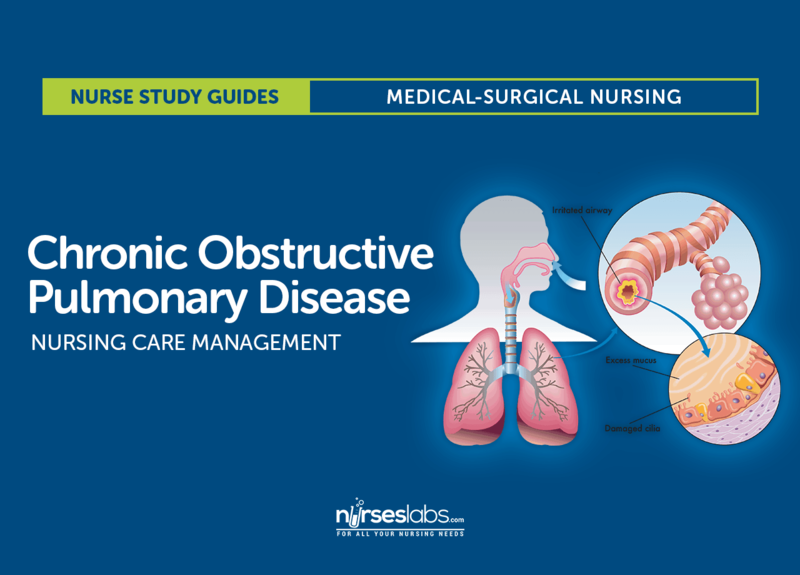 Nurses care for patients with COPD across the spectrum of care, from outpatient to home care to emergency department, critical care, and hospice settings. Chronic Obstructive Pulmonary Disease (COPD) is a condition of chronic dyspnea with expiratory airflow limitation that does not significantly fluctuate. This updated definition is a broad description of COPD and its signs and symptoms. There are two classifications of COPD: chronic bronchitis and emphysema. These two types of COPD can be sometimes confusing because there are patients who have overlapping signs and symptoms of these two distinct disease processes. Chronic bronchitis is a disease of the airways and is defined as the presence of cough and sputum production for at least 3 months in each of 2 consecutive years. Chronic bronchitis is also termed as “blue bloaters”. Pollutants or allergens irritate the airways and leads to the production of sputum by the mucus-secreting glands and goblet cells. A wide range of viral, bacterial, and mycoplasmal infections can produce acute episodes of bronchitis. Pulmonary Emphysema is a pathologic term that describes an abnormal distention of airspaces beyond the terminal bronchioles and destruction of the walls of the alveoli. People with emphysema are also called “pink puffers”. There is impaired carbon dioxide and oxygen exchange, and the exchange results from the destruction of the walls of overdistended alveoli. There are two main types of emphysema: panlobular and centrilobular. In panlobular, there is destruction of the respiratory bronchiole, alveolar duct, and alveolus. All spaces in the lobule are enlarged. In centrilobular, pathologic changes occur mainly in the center of the secondary lobule. In COPD, the airflow limitation is both progressive and associated with an abnormal inflammatory response of the lungs to noxious gases or particles. An inflammatory response occurs throughout the proximal and peripheral airways, lung parenchyma, and pulmonary vasculature. Due to the chronic inflammation, changes and narrowing occur in the airways. There is an increase in the number of goblet cells and enlarged submucosal glands leading to hypersecretion of mucus. Scar formation. This can cause scar formation in the long term and narrowing of the airway lumen. Wall destruction. Alveolar wall destruction leads to loss of alveolar attachments and a decrease in elastic recoil. The chronic inflammatory process affects the pulmonary vasculature and causes thickening of the vessel lining and hypertrophy of smooth muscle. Mortality for COPD has been increasing ever since while other diseases have decreasing mortalities. COPD is the fourth leading cause of death in the United States. COPD also account for the death of 125, 000 Americans every year. Mortality from COPD among women has increased, and in 2005, more women than men died of COPD. Approximately 12 million Americans live with a diagnosis of COPD. An additional 2 million may have COPD but remain undiagnosed. The annual cost of COPD is approximately $42.6 billion with overall healthcare expenditures of $26.7 billion. Smoking depresses the activity of scavenger cells and affects the respiratory tract’s ciliary cleansing mechanism. Occupational exposure. Prolonged and intense exposure to occupational dust and chemicals, indoor air pollution, and outdoor air pollution all contribute to the development of COPD. Genetic abnormalities. The well-documented genetic risk factor is a deficiency of alpha1- antitrypsin, an enzyme inhibitor that protects the lung parenchyma from injury. The natural history of COPD is variable but is a generally progressive disease. Chronic cough. Chronic cough is one of the primary symptoms of COPD. Sputum production. There is a hyperstimulation of the goblet cells and the mucus-secreting gland leading to overproduction of sputum. Dyspnea on exertion. Dyspnea is usually progressive, persistent, and worsens with exercise. Dyspnea at rest. As COPD progress, dyspnea at rest may occur. Weight loss. Dyspnea interferes with eating and the work of breathing is energy depleting. Barrel chest. In patients with emphysema, barrel chest thorax configuration results from a more fixed position of the ribs in the inspiratory position and from loss of elasticity. Prevention of COPD is never impossible. Discipline and consistency are the keys to achieving freedom from chronic pulmonary diseases. Smoking cessation. This is the single most cost-effective intervention to reduce the risk of developing COPD and to stop its progression. Healthcare providers should promote cessation by explaining the risks of smoking and personalizing the “at-risk” message to the patient. There are two major life-threatening complications of COPD: respiratory insufficiency and failure. Respiratory failure. The acuity and the onset of respiratory failure depend on baseline pulmonary function, pulse oximetry or arterial blood gas values, comorbid conditions, and the severity of other complications of COPD. Respiratory insufficiency. This can be acute or chronic, and may necessitate ventilator support until other acute complications can be treated. Diagnosis and assessment of COPD must be done carefully since the three main symptoms are common among chronic pulmonary disorders. Health history. The nurse should obtain a thorough health history from patients with known or potential COPD. Pulmonary function studies. Pulmonary function studies are used to help confirm the diagnosis of COPD, determine disease severity, and monitor disease progression. Spirometry. Spirometry is used to evaluate airway obstruction, which is determined by the ratio of FEV1 to forced vital capacity. ABG. Arterial blood gas measurement is used to assess baseline oxygenation and gas exchange and is especially important in advanced COPD. Chest x-ray. A chest x-ray may be obtained to exclude alternative diagnoses. CT scan. Computed tomography chest scan may help in the differential diagnosis. Screening for alpha1-antitrypsin deficiency. Screening can be performed for patients younger than 45 years old and for those with a strong family history of COPD. Chest x-ray: May reveal hyperinflation of lungs, flattened diaphragm, increased retrosternal air space, decreased vascular markings/bullae (emphysema), increased bronchovascular markings (bronchitis), normal findings during periods of remission (asthma). Pulmonary function tests: Done to determine cause of dyspnea, whether functional abnormality is obstructive or restrictive, to estimate degree of dysfunction and to evaluate effects of therapy, e.g., bronchodilators. Exercise pulmonary function studies may also be done to evaluate activity tolerance in those with known pulmonary impairment/progression of disease. The forced expiratory volume over 1 second (FEV1): Reduced FEV1 not only is the standard way of assessing the clinical course and degree of reversibility in response to therapy, but also is an important predictor of prognosis. Total lung capacity (TLC), functional residual capacity (FRC), and residual volume (RV): May be increased, indicating air-trapping. In obstructive lung disease, the RV will make up the greater portion of the TLC. Arterial blood gases (ABGs): Determines degree and severity of disease process, e.g., most often Pao2is decreased, and Paco2 is normal or increased in chronic bronchitis and emphysema, but is often decreased in asthma; pH normal or acidotic, mild respiratory alkalosis secondary to hyperventilation (moderate emphysema or asthma). DL CO test: Assesses diffusion in lungs. Carbon monoxide is used to measure gas diffusion across the alveocapillary membrane. Because carbon monoxide combines with hemoglobin 200 times more easily than oxygen, it easily affects the alveoli and small airways where gas exchange occurs. Emphysema is the only obstructive disease that causes diffusion dysfunction. Bronchogram: Can show cylindrical dilation of bronchi on inspiration; bronchial collapse on forced expiration (emphysema); enlarged mucous ducts (bronchitis). Lung scan: Perfusion/ventilation studies may be done to differentiate between the various pulmonary diseases. COPD is characterized by a mismatch of perfusion and ventilation (i.e., areas of abnormal ventilation in area of perfusion defect). Complete blood count (CBC) and differential: Increased hemoglobin (advanced emphysema), increased eosinophils (asthma). Blood chemistry: alpha1-antitrypsin is measured to verify deficiency and diagnosis of primary emphysema. Sputum culture: Determines presence of infection, identifies pathogen. Cytologic examination: Rules out underlying malignancy or allergic disorder. Electrocardiogram (ECG): Right axis deviation, peaked P waves (severe asthma); atrial dysrhythmias (bronchitis), tall, peaked P waves in leads II, III, AVF (bronchitis, emphysema); vertical QRS axis (emphysema). Exercise ECG, stress test: Helps in assessing degree of pulmonary dysfunction, evaluating effectiveness of bronchodilator therapy, planning/evaluating exercise program. Healthcare providers perform medical management by considering the assessment data first and matching the appropriate intervention to the existing manifestation. Bronchodilators. Bronchodilators relieve bronchospasm by altering the smooth muscle tone and reduce airway obstruction by allowing increased oxygen distribution throughout the lungs and improving alveolar ventilation. Corticosteroids. A short trial course of oral corticosteroids may be prescribed for patients to determine whether pulmonary function improves and symptoms decrease. Other medications. Other pharmacologic treatments that may be used in COPD include alpha1-antitrypsin augmentation therapy, antibiotic agents, mucolytic agents, antitussive agents, vasodilators, and narcotics. Optimization of bronchodilator medications is first-line therapy and involves identifying the best medications or combinations of medications taken on a regular schedule for a specific patient. Hospitalization. Indications for hospitalization for acute exacerbation of COPD include severe dyspnea that does not respond to initial therapy, confusion or lethargy, respiratory muscle fatigue, paradoxical chest wall movement, and peripheral edema. Oxygen therapy. Upon arrival of the patient in the emergency room, supplemental oxygen therapy is administered and rapid assessment is performed to determine if the exacerbation is life-threatening. Antibiotics. Antibiotics have been shown to be of some benefit to patients with increased dyspnea, increased sputum production, and increased sputum purulence. Patients with COPD also have options for surgery to improve their condition. Bullectomy. Bullectomy is a surgical option for select patients with bullous emphysema and can help reduce dyspnea and improve lung function. Lung Volume Reduction Surgery. Lung volume reduction surgery is a palliative surgery in patients with homogenous disease or disease that is focused in one area and not widespread throughout the lungs. Lung Transplantation. Lung transplantation is a viable option for definitive surgical treatment of end-stage emphysema. Management of patients with COPD should be incorporated with teaching and improving the respiratory status of the patient. Assessment of the respiratory system should be done rapidly yet accurately. Assess patient’s exposure to risk factors. Assess the patient’s past and present medical history. Assess the signs and symptoms of COPD and their severity. Assess the patient’s knowledge of the disease. Assess the patient’s vital signs. Assess breath sounds and pattern. Diagnosis of COPD would mainly depend on the assessment data gathered by the healthcare team members. Impaired gas exchange due to chronic inhalation of toxins. Ineffective airway clearance related to bronchoconstriction, increased mucus production, ineffective cough, and other complications. Ineffective breathing pattern related to shortness of breath, mucus, bronchoconstriction, and airway irritants. Self-care deficit related to fatigue. Activity intolerance related to hypoxemia and ineffective breathing patterns. Ventilation/oxygenation adequate to meet self-care needs. Nutritional intake meeting caloric needs. Disease process/prognosis and therapeutic regimen understood. Assist with measures to facilitate gas exchange. Prevent complications, slow progression of condition. Provide information about disease process/prognosis and treatment regimen. Patient and family teaching is an important nursing intervention to enhance self-management in patients with any chronic pulmonary disorder. The nurse must appropriately administer bronchodilators and corticosteroids and become alert for potential side effects. Direct or controlled coughing. The nurse instructs the patient in direct or controlled coughing, which is more effective and reduces fatigue associated with undirected forceful coughing. Inspiratory muscle training. This may help improve the breathing pattern. Diaphragmatic breathing. Diaphragmatic breathing reduces respiratory rate, increases alveolar ventilation, and sometimes helps expel as much air as possible during expiration. Pursed lip breathing. Pursed lip breathing helps slow expiration, prevents collapse of small airways, and control the rate and depth of respiration. Manage daily activities. Daily activities must be paced throughout the day and support devices can be also used to decrease energy expenditure. Exercise training. Exercise training can help strengthen muscles of the upper and lower extremities and improve exercise tolerance and endurance. Walking aids. Use of walking aids may be recommended to improve activity levels and ambulation. Monitor cognitive changes. The nurse should monitor for cognitive changes such as personality and behavior changes and memory impairment. Monitor pulse oximetry values. Pulse oximetry values are used to assess the patient’s need for oxygen and administer supplemental oxygen as prescribed. Prevent infection. The nurse should encourage the patient to be immunized against influenza and S. pneumonia because the patient is prone to respiratory infection. Identifies the hazards of cigarette smoking. Identifies resources for smoking cessation. Enrolls in smoking cessation program. Verbalizes the need for fluids. Performs activities with less shortness of breath. It is important for the nurse to assess the knowledge of patient and family members about self-care and the therapeutic regimen. Setting goals. If the COPD is mild, the objectives of the treatment are to increase exercise tolerance and prevent further loss of pulmonary function, while if COPD is severe, these objectives are to preserve current pulmonary function and relieve symptoms as much as possible. Temperature control. The nurse should instruct the patient to avoid extremes of heat and cold because heat increases the temperature and thereby raising oxygen requirements and high altitudes increase hypoxemia. Activity moderation. The patient should adapt a lifestyle of moderate activity and should avoid emotional disturbances and stressful situations that might trigger a coughing episode. Breathing retraining. The home care nurse must provide the education and breathing retraining necessary to optimize the patient’s functional status. Documentation is an essential part of the patient’s chart because the interventions and medications given and done are reflected on this part. Document assessment findings including respiratory rate, character of breath sounds; frequency, amount and appearance of secretions laboratory findings and mentation level. Document conditions that interfere with oxygen supply. Document plan of care and specific interventions. Document liters of supplemental oxygen. Document client’s responses to treatment, teaching, and actions performed. Document modifications to plan of care. Document attainment or progress towardsgoals. Inflamed airways that obstruct airflow. Mucus secretion that blocks airways. Characterized by variations in all of the above. Inflammation, hypersecretion of mucus, and alveolar wall destruction are included in the pathophysiology of COPD.Option A: Inflammation occurs through the proximal and peripheral airways, lung parenchyma, and pulmonary vasculature. Option B: Hypersecretion occurs due to the increase in the number of goblet cells. Option C: Alveolar wall destruction leads to loss of alveolar attachments and a decrease in elastic recoil. Areas identified in all of the above. The airways, parenchyma, and pulmonary vasculature undergo inflammation in COPD.Option A: The airways are inflamed in COPD. Option B: The lung parenchyma undergoes an inflammatory response in COPD. Option C: The pulmonary vasculature is affected by inflammation in COPD. Cigarette smoking is the foremost factor in the development of emphysema.Option A: Air pollution is a risk factor in the development of emphysema but it is not the primary factor. Option B: Allergens may contribute to the development of emphysema but it is not the main factor. Option C: Infectious agents are part of the risk factors for emphysema but it is not the main factor. B. Chronic bronchitis and emphysema. D. Tuberculosis and pleural effusion. A. Inflamed airways that obstruct airflow. B. Mucus secretion that blocks airways. D. Characterized by variations in all of the above. D. Areas identified in all of the above. 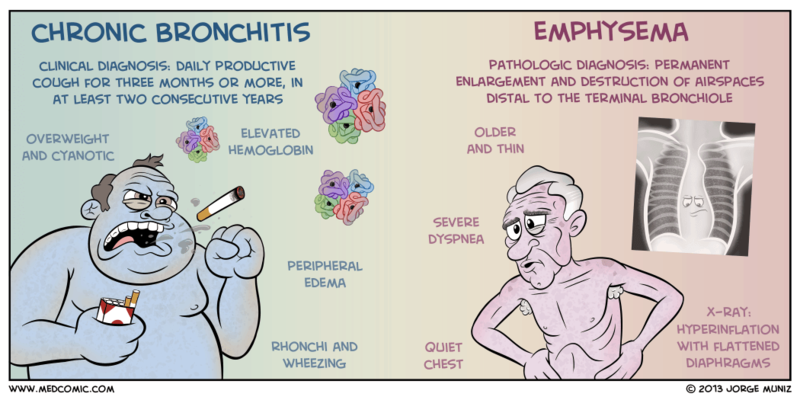 Chronic bronchitis and emphysema belong to the old classification of COPD. Option A: Asthma may be one of the chronic pulmonary diseases but atelectasis is not. Option C: Pneumonia and pleurisy are not classified under the COPD. Option D: Tuberculosis and pleural effusion are not chronic pulmonary diseases. 3. Answer: D. Characterized by variations in all of the above. Inflammation, hypersecretion of mucus, and alveolar wall destruction are included in the pathophysiology of COPD. 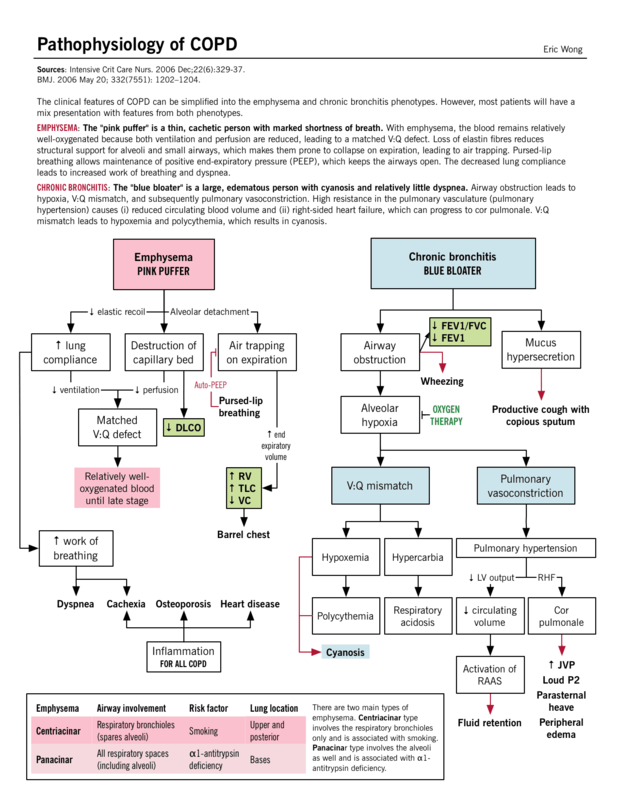 Option A: Inflammation occurs through the proximal and peripheral airways, lung parenchyma, and pulmonary vasculature. Option B: Hypersecretion occurs due to the increase in the number of goblet cells. Option C: Alveolar wall destruction leads to loss of alveolar attachments and a decrease in elastic recoil. The airways, parenchyma, and pulmonary vasculature undergo inflammation in COPD. Option A: The airways are inflamed in COPD. Option B: The lung parenchyma undergoes an inflammatory response in COPD. Option C: The pulmonary vasculature is affected by inflammation in COPD. Cigarette smoking is the foremost factor in the development of emphysema. Option A: Air pollution is a risk factor in the development of emphysema but it is not the primary factor. Option B: Allergens may contribute to the development of emphysema but it is not the main factor. Option C: Infectious agents are part of the risk factors for emphysema but it is not the main factor. This article is very helpful with nursing plans with first semester nursing students. Thank you.